Guide to Füssen - urs-langenbachers Webseite! Füssen is located in the very south of Germany just on the Austrian border at the end of the A7 motorway. It takes 1.5 hours to drive from Munich, Augsburg, Lindau or Innsbruck (1h from Ulm). Füssen is connected to Augsburg and Munich by train wich runs every hour, the duration of the journey is 2h. The exit of the parking garage is in front of the Sparkasse on the Kaiser-Maximilian-Platz. 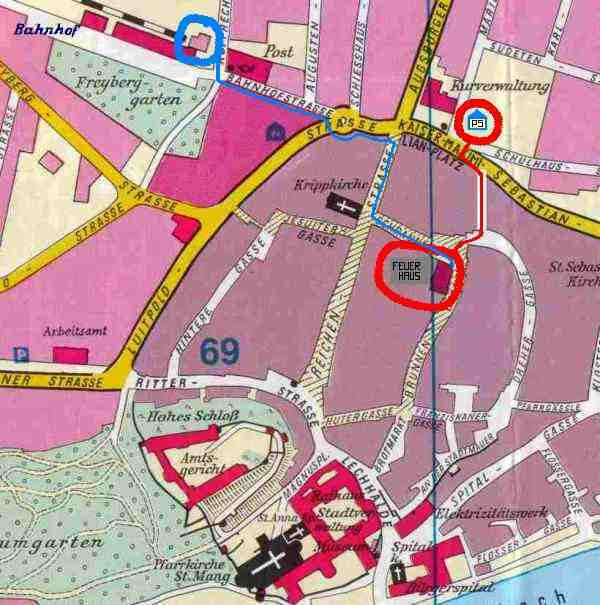 Use the nearby pedestrian traffic lights and walk trough the old town wall to the old inner town. Turn right onto the Schrannenplatz where you find the old "Feuerhaus".